Spectacular Views of Ocean, Highlands, and the Famous Cabot Trail Can Be Yours! Leave your worries behind as you breath in salt air, feel the refreshing ocean breezes, and stop to enjoy the views - ocean vistas complete with an island and lighthouse, and the famous Cape Breton Highland National Park all from the comfort of this well appointed Beach House. The home features 4 bedrooms (3 on main and 1 in lower level) and comfortably sleeps 8. The gourmet kitchen is well appointed with stainless steel appliances and all of the cooking utensils you might need including a lobster/crab pot and propane burner to cook the delicious lobster caught fresh in the waters off of the house. Enjoy cocktails, relax and share stories about your day on the deck while watching the stunning sunsets before lighting a fire in your own fire pit near the beach front. The Beach House is located 5 m from Cape Breton Highlands National Park world renowned for its incredible scenic vistas and wild life and is minutes from an authentic Acadian fishing village, Cheticamp, where you can listen to live fiddle music in numerous venues, and dine on the local catch of the day. Take a day and travel the Cabot Trail and return to the Beach House to relax, enjoy a cocktail, prepare a feast for family and friends, and be wowed by nature's gift of a fiery sunset on the deck! Dave and I hope to make Cape Breton and this home our "forever place" but until we can we thought others should be able to enjoy what it and this area have to offer. Dave and I have shared a love of Cape Breton and the natural beauty that it offers for many years and in 2010 decided we wanted to have the chance to spend more time here. Our work lives are busy and we travel constantly. The Beach House is our place to relax, slow down, unwind and enjoy the enchanting kindness of the people from this island. Cape Breton Highlands National Park is 4 km or 5 m away. Bring a book, leave a book. Large outdoor deck with views of Trail. Well- appointed ocean front home. Our 3 generation group of four adults were very comfortable in this cozy ocean-front home. Everything was just as described including the well-stocked gourmet kitchen to the panoramic views from every window. The village of Cheticamp is a warm and friendly place to visit. We explored the Cabot Trail and Highlands Nat'l Park and also drove to Sydney for the finale of the Celtic Colours Festival. Our favorites included the Aucoin Bakery and Le Gabriel for seafood and live music. Thank you for sharing your lovely home with our family. We enjoyed having you as guests and appreciated your hardy spirit as you experienced some of the wild and wonderful weather that Cape Breton has to offer at this time of the year. Very glad that you were able to take in the Celtic Colours Festival!! Beautiful house with amazing views! The house is lovely inside with a thoroughly equipped kitchen - so well equipped that we were able to cook/bake some Acadian specialties. The view from the front windows is gorgeous, looks like you're looking out over a ship's prow. The bedrooms were comfortable. The living area, kitchen and dining area are one huge room that manages to remain cozy. All in all, the experience is well worth it. We enjoyed magnificent views of the water and an amazing night under the stars watching the Perseid meteor showers. The house was immaculate and Karen was very responsive to all our questions. Highly recommended. The Beach House provided an ideal setting for our August vacation for two couples. It is clean and well maintained,; views all around are astonishingly beautiful; from the yard there are stairs to a beach of colorful, patterned smooth rocks - owners provide beach shoes for walking, wading or swimming,; the kitchen is well stocked for cooking; the inside and deck dining areas are lovely; comfortable beach chairs are provided for enjoying a fire circle overlooking the sea, The owners provide engaging books and videos for quiet times. They responded quickly to our inquires and our interactions have been so pleasant. I would not hesitate to recommend the property to friends. The house is also ideally located. It offers privacy, yet is walking distance to the seaside town center of Cheticamp, Though small, the town has a well stocked grocery and pharmacy as well as a health food store, opportunities to listen to enjoyable foot tapping fiddling music, an outstanding bakery, fresh seafood and delicious local cider, a yoga studio, and a 100+ year old majestic cathedral that guests are invited to visit. Le Portage, an18-hole golf course, is challenging and well laid out, and only about a half mile from the property. We also enjoyed hikes in the nearby National Park where there are options for all abilities. This property is a special find for guests who are looking for a relaxing vacation in a beautiful place with lots of great opportunities for enjoying nature, local music, and exercise. Lucile, we loved having you as our guest and so appreciated the photos you shared of the bald eagle. We have posted the photo of the young eagle on the VRBO/HomeAway website so others can enjoy! A little piece of heaven! We stayed at the Beach House for one week in August and absolutely loved it! Our group was made up of six adults and two young children. The house itself is beautiful. The kitchen is fantastic. Very well equipped. I had brought some things from home but I needn't have bothered. Karen and Dave have thought of everything. There is a large island in the kitchen as well as a big dining table but most of our meals were taken out on the deck where we could see the water and the mountains of the Cape Breton Highlands. The views are amazing and the house is set up to take advantage of all of them. There is a lovely large bay window on both the main and lower level - perfect for sitting and watching the water. While we didn't have a sunset every night the ones we did have were spectacular. Everything was very clean and beautifully decorated. The bedrooms were very comfortable. My husband and I had the master bedroom and it was a real treat to go to sleep to the sound of the water and wake up to such a fantastic view. There is a lovely sitting area with cozy couches to watch movies or read or just stare out the window. There are toys and games provided for the little ones as well as some games and entertainment for the not so little ones. We enjoyed going down to the beach and the kids loved having marshmallows down at the firepit. The Beach House is located very close to Cheticamp where you can get groceries and other supplies. Not far from the Beach House is the Aucoin Bakery- everything there is delicious! It is also close to western gate to Cape Breton Highlands National Park where the Cabot Trail winds its way through some of the most beautiful scenery on earth. My husband is originally from Cape Breton and we have been coming every year for decades- when our kids were little and now with our adult kids and grandkids. 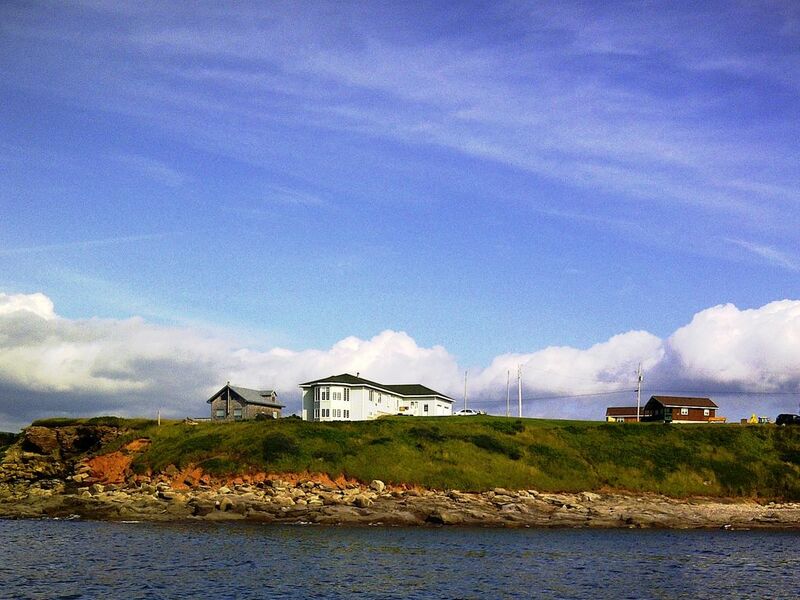 Cape Breton is a special place to us- we have so many great memories from all our trips. We have stayed in many different locations around the island. I think this is my favourite. I would definitely recommend the Beach House to friends and relatives even though I am tempted to keep it a secret. I almost hate to share it! It was such a wonderful week, we truly hated to leave. Thank you Karen and Dave for sharing it with us. Lynne, Dave and I thank you for your wonderful review. We agree that Cape Breton, Cheticamp and area are indeed a "little peace of heaven". We enjoyed having you as our guests! We stayed at the Beach House for a week in July, and had a marvelous time. The house was spotless and equipped for every eventuality. A huge bay window provided wonderful views of Cheticamp Island and its lighthouse on one side, and the Cape Breton Highlands on the other. The crab fishermen seemed to start work around 4:00 am, and continued until sunset. How pleasant it was to sit in that window, watching them , and forgetting completely about the rest of the world. Karen and Dave were so easy to communicate with, and answered all our. music, visited three funky art galleries, made a daily trip to the bakery, drove the Cabot trail, and saw a large pod of pilot whales on a trip out of Pleasant Bay. And then there was the food! Perhaps the meat dishes in Cheticamp were good. I don't know. All we ate was seafood from one of the many excellent restaurants. it was a great holiday! Just one word of warning: Don't get too comfortable. You might want to stay forever. Thank you for your wonderful review!